The Skullcandy Crusher Wireless aren't going to be the best sounding headphones you've ever heard, but for around $100 they offer a decent build quality and insanely long battery life. Some people want the very best sounding pair of headphones, full stop. While everyone perceives sound differently, trained ears definitely have a few favorite go-to brands and pairs of cans they’d recommend. For everyone else, there’s Skullcandy—and that’s not necessarily a bad thing. The company is probably one of the most well-known audio companies due in no small part to them being available in everything from electronics stores to the local drugstore. Today, we’re looking at the Skullcandy Crusher Wireless headphones which are one of its more interesting pairs. At roughly $100, are they actually good? Or are they just good for “most people”? Commuters: While these don’t have active noise cancelling, they do have plush earpads that do a decent job at blocking outside noise. Anyone on a budget: At $100, the Skullcandy Crusher Wireless are an all-around solid choice with an amazing battery life. How are the Skullcandy Crusher Wireless built? The Skullcandy Crusher Wireless headphones have folding hinges for a more portable way to carry. Now I know we’re supposed to head into reviews with an open mind, but sometimes it’s tough to forget everything you’ve heard about a product or company. This was one of those times. Skullcandy isn’t exactly known for its—ahem—luxury build. While the Skullcandy Crusher Wireless are made of cheaper plastic, they’re not nearly as bad as I thought they’d be. They have a matte black coating that’s surprisingly not fingerprint prone, along with some solid earcup padding and faux leather on top of the headband. The buttons along the bottom of the headphones are definitely made of the cheap plastic I was expecting, but the tactile response is almost perfect. There’s also the bass slider on the left earcup which was stiff in my experience and could be a little smoother. Inside, there’s a second pair of drivers that only provide low end haptic feedback, and this slider lets you control how much (if any) extra bass you want. On the headband is a small cutout that makes the rubber plastic headband way more comfortable for long listening sessions. 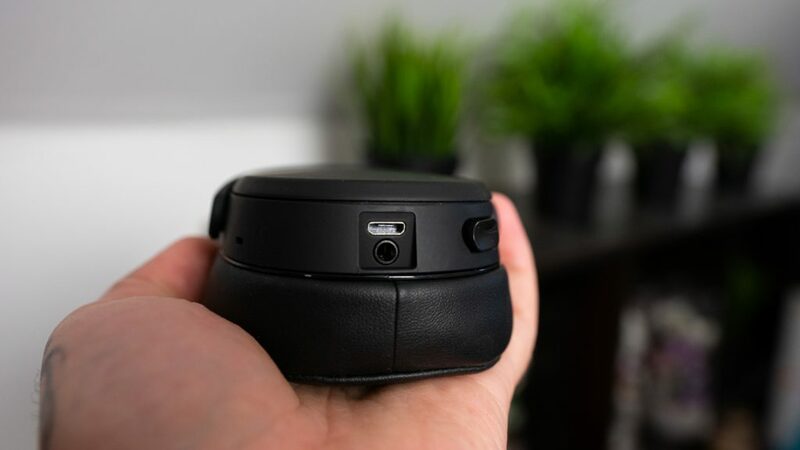 Besides that, the Crusher Wireless has folding hinges that make them more compact for tossing in your bag. Plus, I’m fairly confident that these won’t get destroyed by the other things in my backpack. My biggest issue with the build quality is also something I really like which is another weird thing to say, but hear me out. The padding on the bottom of the headband is made of a similar cheap rubber that you’d find on something like the Beats EP that I recently reviewed. In that review, I noted how the rubber was insanely uncomfortable on the crown of my head—a problem that Skullcandy avoided by simply having a small cutout. It’s genius because it works. While the rubber still pulls my hair occasionally and remains my least favorite form of padding, these are at least not painful to wear for long periods of time. Besides that, the overall design of the Crusher Wireless is right up my alley. The only branding you’ll find is a discreet logo just above either earcup. The all black option we’re looking at here is also understated enough to wear on a commute or the office without a problem. I can see just about anyone rocking these, which is something that can’t be said for many headphones in this price range and also something that I can’t really say about the white and grey color option. 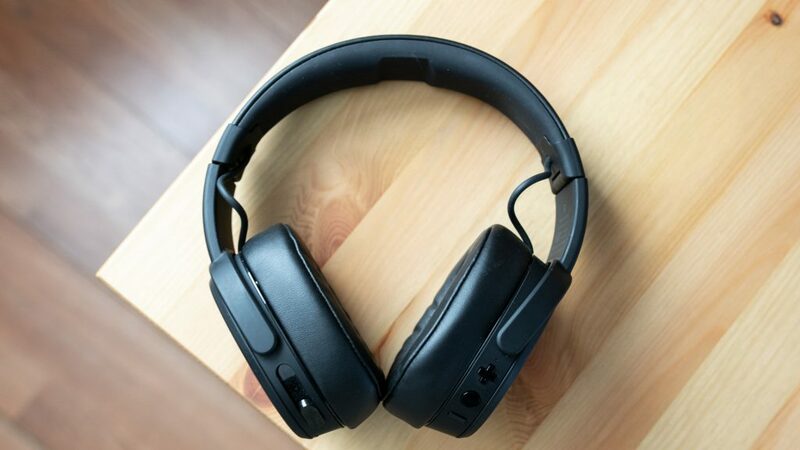 The Skullcandy Crusher Wireless have Bluetooth and a solid connection in everyday use, though there is some notable skipping once you’re teetering around the 30 foot limit of the Bluetooth range which is to be expected. If you prefer a wired connection there’s also a 3.5mm input on the bottom of the left earcup. There are only three playback on the right earcup and a bass slider on the left. Playback controls are all fairly simple as well, with three buttons on the right ear cup letting you pause/play music, adjust volume, skip between tracks, and access your phones personal assistant. My only problem with them is that they’re a little too loud when you click them and you can even hear them over the music in some cases. On the bright side, there’s no noticeable audio lag when watching videos so if you tend to watch a lot of videos you don’t have anything to worry about here. On the bottom of the left earcup is a 3.5mm input and a micro USB charging port. Skullcandy claims a battery life of roughly 40 hours of constant playback, which would be fairly impressive all on its own. However, in our objective testing, it surpassed even that clocking in at 57 hours and 28 minutes. To be fair though, this was with the bass slider turned all the way down, so if you think you’re going to be using pumping bass often you should expect a little less. The biggest downside here is that in order to charge them you’re going to have to use an older micro USB cable instead of the newer USB-C. While that may not be a problem for most people now, it will get a little more annoying in a few years when everything is USB-C. On the bright side, ten minutes on the charger will give you roughly three hours of constant playback so if you forget to charge them overnight, it won’t take too long on the charger to get a decent amount of battery life back. The headphones have plenty of plush padding that make them fairly comfortable. While the sound quality of the Skullcandy Crusher Wireless isn’t what I usually prefer, I didn’t find it too bad here. For the sake of testing, I kept the bass slider turned off so I can get a feel for how these sounded without any additional help. That said, they still have plenty of low-end emphasis which makes these great for bass-heads, especially considering that you can adjust the bass even more with the slider. While the isolation isn’t great in the low end, these do a decent job at blocking much of the higher frequencies. The Skullcandy Crusher Wireless put a slight emphasis on the lower end, with another dip around 600Hz as well. If you’re looking for Beats-level bass and then some, crank that slider all the way up. On the other hand, mids suffer from the overbearing bass notes in most cases. This can be heard throughout the song Patient is the Night by The Blasting Company where the bassline basically overpowers the soft strumming of the guitar in the background. You can barely hear the chords as the lack of clarity and the overemphasized bass seemingly puts them far in the background. This pattern is true in most songs that I listened to, and while the high notes also seems to have a decent emphasis on them I didn’t find anything spectacular about them. They never became harsh, but they the soft hi-hats through the chorus of You’ve Got Me Running in Circles by Sonny Cleveland don’t really sound the way they should compared to everything else going on. This is likely due to the fact that most headphones with a consumer friendly sound tend to boost frequencies in the highs to compete with the ranges of emphasis elsewhere, but the Skullcandy Crusher Wireless doesn’t quite do that here. Despite not being the best sounding headphones at this price point, I was really impressed by the overall package that the Skullcandy Crusher Wireless offer. They’re a solid alternative to anyone who wants a consumer-friendly sound without paying Beats prices. At the same time, they’re not a bad pair of everyday headphones either. While they’re not insanely well-made, they seem like they’d hold up well to everyday wear and tear. Plus, they also offer some decent isolation from outside noise. At around $100, they’re not a bad buy as long you know that you’re not buying them for the sound quality. You’re getting them for the crazy long battery life and the portable build.